New snowmaking lines are crawling up the slope at [R081R, Bridger Bowl] this year. The added snowmaking capabilities will be a boon to recreational skiers and racers alike, enhancing improvements made last year with the new Bridger lift and road cut removal. Bridger Bowl installed the new Bridger triple lift for last season after ripping out two aging double chairs. Some locals were skeptical of the math, unsure that a more reliable, stronger triple lift could move the same amount of skiers and riders uphill as two lifts. But doubt disappeared. "The new Bridger worked really well. Locals who were very skeptical were believers because there were no lift lines," Spokesperson Doug Wales said. "It was a nice change and a great improvement." Last year, crews also took out the old switchback road that sliced across several runs. The road cuts forced skiers to stop or break their turn rhythm. "Taking out the road cut from Sluice Box to Avalanche Gulch made for great skiing with an uninterrupted fall line," Wales said. This year, the resort is extending snowmaking up the Bridger Lift to the midway unloading station. "That will provide good early season coverage for opening," Wales said. "It'll also provide a solid base for ski races." Bridger Bowl plans to host the 2012 NCAA Championships March 7-10. The resort will be staging the giant slalom and slalom championship races while Bohart Ski Ranch up the road will host the Nordic races. The resort is also adding more ways for Bridger fans to assess snow conditions. Two more cams will be installed. One cam will point at the Apron and the other at the stake that records new snowfall. Two proposed future triple lifts will replace the Alpine Lift. 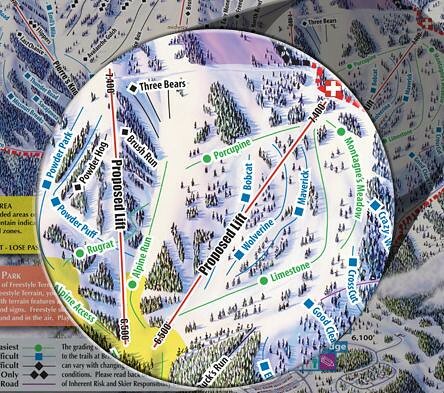 Map Courtesy of Bridger Bowl. While projects for this year's opening steam ahead, plans are already in the works for more lift improvements. Bridger aims to replace the aging Alpine chair with two triples. From the Alpine base, the proposed lifts would shoot up two different directions. 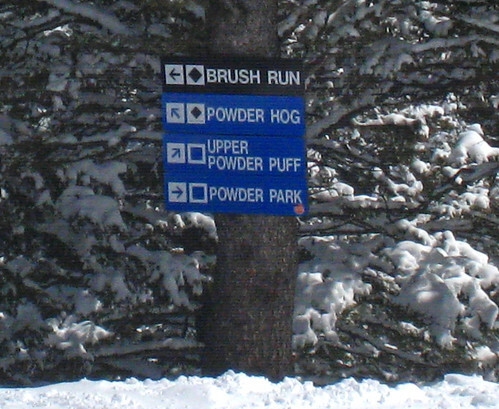 One chair would go to below North Bowl above Powder Park and the other to the north boundary runs. "With a good winter season, we could do installation as soon as next summer," Wales said. One of the new proposed lifts will drop skiers and riders at the top of Powder Park. Photo by Becky Lomax.